In addition to undeniable cool factor of wearable tech—think spy-like smartwatches, shirts and sports bras that can measure heart rate, clothes with built-in air conditioning, and much more—this space has plenty of room for noble and potentially life-saving applications. 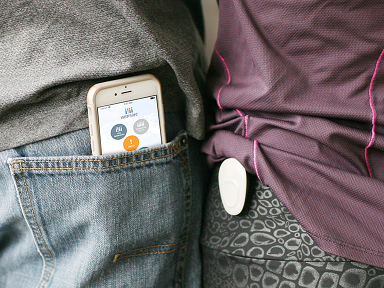 Wearsafe Tag, developed by Connecticut-based tech startup, Wearsafe Labs, is essentially Life Alert for everyone; it provides an added layer of security for anyone who wants to feel safe in certain situations. The device can be worn discretely by clipping to a waist-line or the inside of a pocket, or being strung to a necklace. The promotional video for the device targets people who lead an active lifestyle, illustrating the example of a biker, or a young woman walking down the street alone after seeing off a loved one. The small device uses Bluetooth technology to tether to a smartphone, and with the press of a button, immediately forwards an alert to preset emergency contacts via text, email and the Wearsafe mobile app. The recipient of the alert is provided the wearer’s location via GPS, and audio from the scene. So, for example, if the biker shown in the video crashes, breaks his leg and is rendered immobile—but his phone slides out of reach in the accident—he can press the button on his Wearsafe Tag, which will put him in touch with someone who can contact emergency medical help. Likewise, if the young woman walking home by herself were attacked, and did not have the time to reach for her phone and dial 911 in the commotion, she could instead press a button to alert her preset contacts, who could then supply law enforcement with the location of the scene. In both scenarios, able-bodied people who might be unable to access the help they need have an extra measure of safety—one that can ultimately be the difference between life and death. The device can also be useful in sensitive situations that may arise from impairment caused by substances. For example, when a young man or woman knows they might be at risk of harm or sexual assault, but might not have the mental facilities to pick up a phone and dial for help—due to alcohol consumption, or worse, to being drugged—all they need to do is press a button. In theory, this type of technology, when employed, could help remove superimposed ambiguities in court that are all-too-often used to cast doubt upon legitimate cases of sexual assault. The device’s intentions are incredibly noble, and the fact that Wearsafe Labs has already exceeded its goal of $75,000 on Kickstarter is a sign that there are interested parties. And while Wearsafe Tags is unlikely to become a huge seller, there will undoubtedly be a market for this device—namely victims or anyone who has experienced traumas similar to the example scenarios mentioned above, who wants to feel safe again. Anyone interested in learning more, or making a contribution to Wearsafe Tag, can visit the official Kickstarter page.